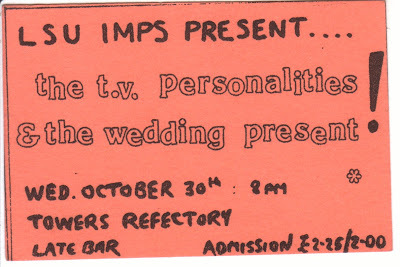 This is definitely one of the earliest Wedding Present performance I've ever heard. Probably one of the earliest in existence. Recorded back in 1985 in the refectory at Towers Halls of residence at Loughborough University where the Leeds based outfit were supporting Television Personalities. I don't have a recording of their set but I suspect the Weddoes may just have been the highlight of the night. Wow. Thank you very, very much for making this available- deeply appreciated. Is it possible to re-upload this live? I would sure love to hear this one but found your great blog just yesterday so some links no longer work. When/if you have some spare time, could you consider re-posting this? Thanks. Having found you now, I'm a bit like a kid in a sweet shop, with loads of tasty bites well-remembered but not experienced for way too long... :) Mike.